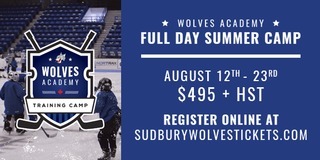 (Greater Sudbury, ON) The Sudbury Wolves wrapped up their pre-season schedule this weekend with an even record of 1 win, 1 loss, and 1 shootout loss. The Wolves hosted the Sault Ste. 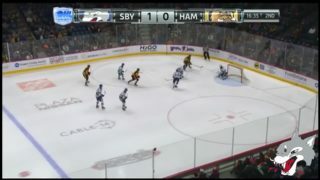 Marie Greyhounds on Thursday, losing a closely contested game that need the OHL Pre-season Shootout format following regulation to settle the score from the 3-3 end of regulation. The Wolves came up short in the shoot out but got them ready for Friday night’s contest vs. the Rouyn-Noranda Huskies of the QMJHL at the inaugural Bell Let’s Talk Charity match hosted by the United Way, the City of Timmins and the Timmins Rock. The Wolves battled Friday night vs. the Huskies to even the score at 6-6 in the final minute with the extra attacker when David Levin scored his second of the game assisted by Quinton Byfield and Macauley Carson. That line combined for 25 points in the pre-season and showed impressive offensive power. Following the win in Timmins, the Wolves travelled to Sault Ste. Marie to play a hard-fought matinee contest in the Soo. 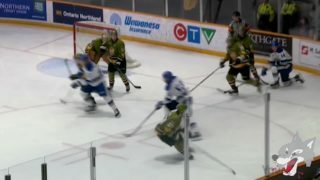 Though the Wolves outshot the Greyhounds 36-34, the Hounds got the better of them in the third period scoring 3 to break the third period tie, taking the contest 6-4. 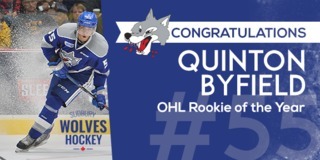 Quinton Byfield, much like the young Wolves started slowly under a difficult pre-season travel schedule but finished off pre-season strong scoring in 3 consecutive games along with linemates David Levin and Macauley Carson. 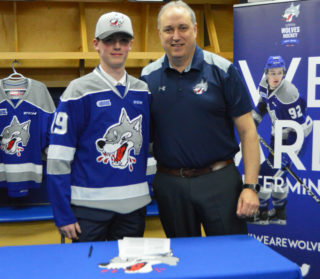 Byfield’s big frame makes him a huge presence on the ice which is hard to miss, but it’s his smooth skating and powerful shot that have fans itching to see the Wolves in action this season. 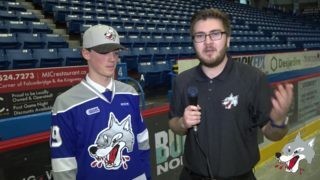 The Wolves now turn their attention to the season and will kick off the OHL regular season on Wednesday night at the NEW SUDBURY CENTRE, Center Court, with their annual Pep Rally. Fans are invited to meet the players and the coaches, get to know the new recruits and cheer on the boys as they hit the road Thursday when then prepare for their first game of the year on Friday in Guelph vs. the Storm. Fans are encouraged to come out Wednesday evening at 7pm as the players will be introduced and a question and answer period will be held and moderated by a representative of the Wolves in game team.